Whether you want to boost your jewelry business by selling instructions and tutorials for your own original beaded jewelry designs, or you want to submit your seed bead patterns for publication to a beading magazine (like, maybe Beadwork magazine? ), you'll have to know how to translate your bead stitching into words that other people can understand and use to create their own versions of your designs. It's not as easy as it sounds, but it doesn't have to be particularly difficult, either. Ready to get started? I've got a few handy tips for writing your own seed bead patterns! Believe it or not, writing a good seed bead pattern begins before you even sit down at your computer. Tracking your progress as you stitch your initial design can help you later on as you're trying to write your final set of instructions! Keep a notebook handy, and make sure you write down the type, size, and quantity of every bead you use in your design. If you're thinking of kitting your beading project, make sure you also write down the color numbers and finishes of the beads you're using. Take photographs of each step as you're beading. Even if you don't use every single photo in your final set of instructions, having photos of your process can help you if you get stuck or can't remember what you did! What Comes First — The Words Or the Pictures? Whether you create illustrations with computer software or you prefer to use photographs, you'll need to make sure that your seed bead patterns can be understood by someone else. Deciding what to do first — written instructions or illustrations — is really just a matter of preference. One method that I find works for me, particularly when I'm dealing with a complex beading project, is to lay out each photograph in front of me in order, and then write the instructions while I'm looking at the photographs. After the words are written down, I can then go back and see which steps merit pictures or illustrations, and which ones are pretty self-explanatory. Probably the most important thing you can do when preparing your seed bead patterns for sale or for publication is to ask a friend to look them over and do a test run of your instructions. After looking at the same words and illustrations for days on end, having a fresh pair of eyes (or two) to scan your seed bead pattern and check for mistakes, or to see if there are any steps that might need further clarification with a photograph or illustration. Materials list. Materials are the things that you use up, like seed beads, thread, jewelry findings, clasps, or glue. Be as thorough and as detailed as you can when listing the beads and other materials you used in your design. It's always appreciated when a designer includes information about bead colors and finishes, too. When estimating the quantity of seed beads, you're always better off over-estimating — you don't want someone running out of seed beads before they finish making your design! Tools list. Tools are the things like beading needles, pliers, scissors, or clamps that are used for the creation of your design. Tips and hints. As you're stitching your project, you may discover a shortcut or a trick for working your favorite beading stitch. 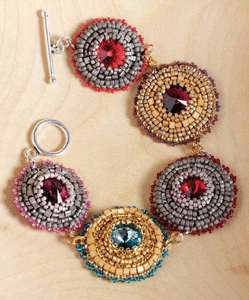 Share these in your finished seed bead pattern — beaders love to learn new things! 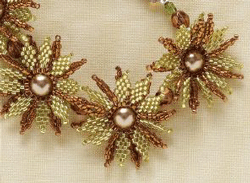 One great trick I use for formatting my seed bead patterns is to copy the style of the patterns laid out in Beadwork magazine. When listing your beads, assign each one a letter (A, B, C) and use that letter when writing your instructions. Because it's really much easier to write a set of instructions like, "String 6A, 3B, 6A, 3B, 1C, 3B, 6A, 3B, and 6A," instead of "String 6 size 11 gold beads, 3 size 15 purple beads…" Right? Simplifying your instructions also make them easier to follow when someone is working from your seed bead pattern. Make More Seed Bead Patterns! The best way to see what works and what doesn't work in writing your own seed bead patterns is to make up lots of different patterns and pay attention to how the instructions are written and illustrated. Make notes about what you like and don't like, and then see if you can get a couple of friends to help you test your patterns before you put them out for sale. Take a look at all the incredible seed bead patterns in Favorite Bead Stitches 2014, available now in the Beading Daily Shop! You'll find 37 spectacular seed bead projects using 32 of your favorite beading techniques including bead crochet, peyote stitch, right-angle weave, and herringbone stitch from some of your favorite bead artists and top designers. 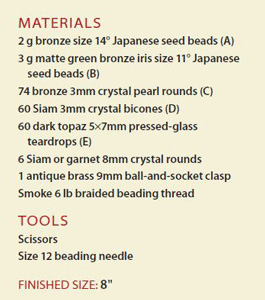 Order your copy of Favorite Bead Stitches 2014 and find inspiration for creating your own seed bead patterns. Do you have tips for someone just starting to write their own seed bead patterns? What do you find most helpful — photographs or illustrations? Leave a comment here on the Beading Daily blog and ask your questions, leave a tip, or share your knowledge of writing seed bead patterns with us!